A nutritionally balanced diet for adult dogs, containing delicious, protein-rich portions of salmon and rice. 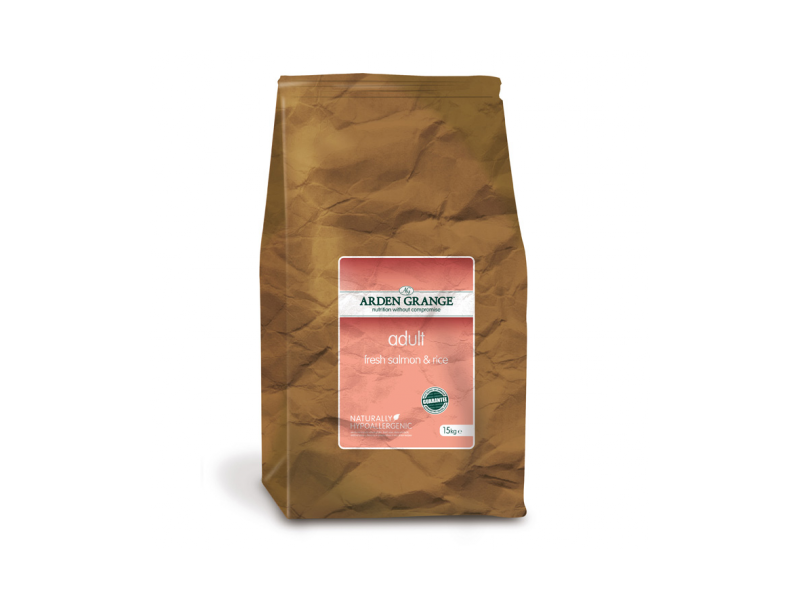 Arden Grange Adult Fresh Salmon & Rice combines a tailored blend of key proteins, fats and vitamins, helping to strengthen and protect muscles, tissues and cells and enhance your dog's natural defenses. Free from all by-products, supplements and additives, making it a natural and digestible food suitable for all dog breeds. Trace Elements: Zinc chelate of amino acid hydrate 250mg, Zinc sulphate monohydrate 208mg, Ferrous sulphate monohydrate 125mg, Manganese sulphate monohydrate 87mg, Cupric sulphate pentahydrate 30mg, Copper chelate of amino acid hydrate 25mg, Ferrous chelate of amino acid hydrate 25mg, Calcium iodate anhydrous 1.8mg, Sodium selenite 0.5mg, Antioxidants (rosemary and tocopherol-rich extracts). There are currently no questions for Arden Grange Adult Fresh Salmon & Rice Dog Food - be the first to ask one!